The Unication Alpha Legend Secure+ Programmer consists of programming software, a programming fixture, a DB9 – USB interface cable and a 5VDC 1A adapter for power. If you have an account, click the Advantage! logo for OSI products! The programming fixture is a standard device and can be used to program all Unication alphanumeric pagers. The POCSAG based programming software is also common to all Unication POCSAG-coded alphanumeric pagers. To begin programming, first install the software. Follow the prompts to configure the programmer accordingly. Once the software installation is complete and the program launched, click the “Setup” menu item at the top of the screen and select “Communication Setup”. Configure your programmer to a free COM port. For hardware configuration, connect the DB9 serial connector to the programming fixture and the USB connector to the computer. Connect the 5VDC power adapter to the fixture and plug it in to an electrical outlet. The Alpha Legend Secure+ pager must have a battery installed and the pager turned on in order to read or program the pager. Insert the pager into the programming fixture, ensuring the two programming pins on the fixture line up with the two holes in the pager located near the battery lock latch. 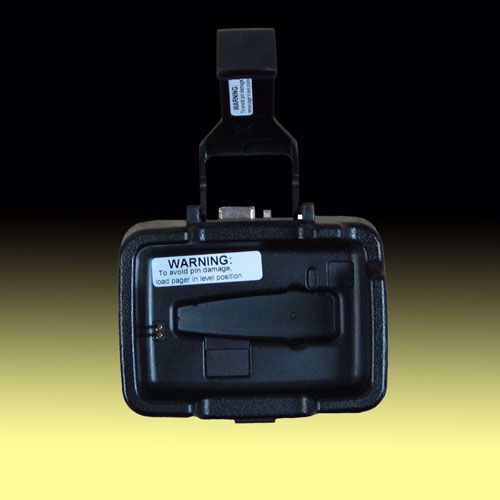 Secure the pager by engaging the fixture’s locking arm across the body of the pager. The COM port is correctly configured and the interface cable connected. The pager has a battery inserted and is powered on. The pager is making good contact with the programming pins and the pins are not broken. The pager is an Alpha Legend Secure+ pager. The Unication Alpha Legend Secure+ is a POCSAG, 4-Line Alphanumeric Pager operational in the VHF and UHF frequency ranges. Following the Alpha Elegant pager, it maintains all of the Elegant’s features while adding secure encrypted messaging and password-locked message view capability.